Mummy Of 3 Diaries: We're Having A Halloween Party Thanks To Poundland..
We're Having A Halloween Party Thanks To Poundland..
Last week the wonderful people over at Poundland sent us a £25 gift voucher and challenged us to go instore to see if we could get everything we needed for our Halloween party. I visit my local store at least once a week anyway as it's a great place to pick up the bits I need at great consistently low prices, plus it's very local to me which is even better. I've never really spent a whole £25 in one go before so I was very excited to see just how much I could get for the money. I knew I needed decorations, fancy dress costumes for the kids and lots of sweet treats for both us and our Trick or Treaters who would call at our door on the night. I managed to fill two bags right to the top on my visit, which I must say I had so much fun doing. 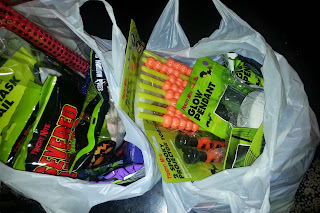 I'm very excited to see my children's faces when they see all the goodies I got for them this Halloween. 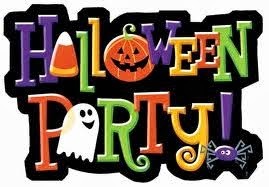 Our party is going to be so much fun and it's not that long away now either. I was very impressed with the Halloween range at my local Poundland, there really was lots to choose from and I managed to get so much for my £25. There was a fantastic selection of sweets and candy (lots of which were individually wrapped which makes them perfect for the Trick or Treaters) and plenty of great spooky decorations. There was lots of kids costume accessories to transform your kids into kitty cats or devilish devils and even some great adult masks too.I've loved this challenge so much - I had a frighteningly fun time! 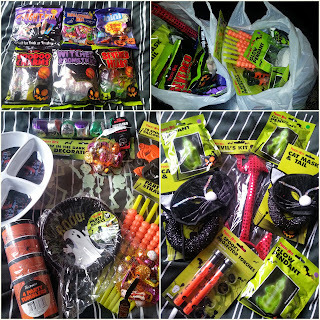 So to answer Poundland's big challenge question: Yes I did get everything I needed BUT I could have easily got everything I needed to have a great Halloween party for much less.